Taxidermy, the artistic and scientific process of preserving animals’ bodies, utilizes a wide variety of chemicals that can have lasting health effects if not used properly. Taxidermy procedures vary depending on the taxidermist’s preferences, type of animal, and the type of preservation but all types must take proper precautions with fume control to ensure safety. Taxidermy comes from the Greek word “taxis” meaning arrangement and “derma” meaning skin1. 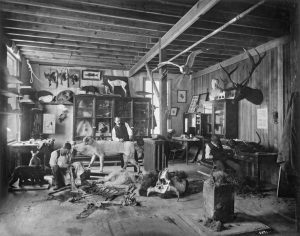 Taxidermy originated during the late 18th century to early 19th century in England where travelers and scientists, such as James Cook and Charles Darwin, used preservation to document animals they discovered during excursions to far away places2. Also, wealthy collectors would display preservations in their homes making taxidermy a highly accepted art form2. Hunters would have their animals stuffed or mounted to display a trophy from their hunt. The golden age of taxidermy was from 1840 to World War I after the discovery of arsenic soap which properly preserved animals preventing decay3. Arsenic is no longer used for taxidermy due to the high level of toxicity and has been banned in most countries. 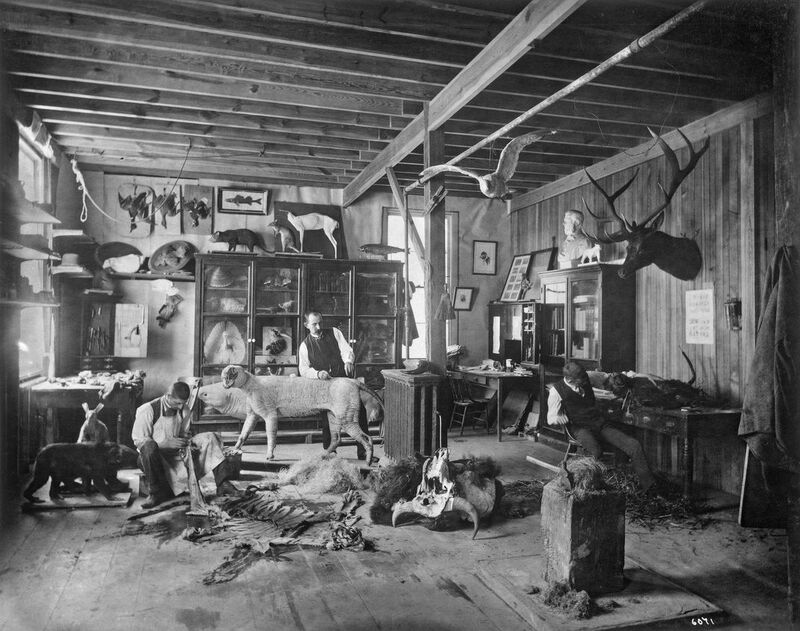 Following World War II, the widespread use of color photography, conservation acts, and ivory trade ban contributed to taxidermy and big game hunting losing popularity3. However, in recent years there has been a resurgence of taxidermy due to the availability of information on the subject from the internet3. The resurgence has focused on the art form of taxidermy with many taxidermists only using animals that died of natural causes. Scientists also use taxidermy to preserve animals for studying1. Many natural history museums have an extensive collection of skins and mounts used for scientific purposes. Taxidermy allows the extinct or endangered animals to be represented during their lifetime to make observations about evolution and distinct animal characteristics. Pelts exist from over 250 years ago and provide the only way for scientists to study animals from that time period. The taxidermy procedure depends on the taxidermist’s preferences as well as the type of preservation. There are four different types of taxidermy or methods of preserving animal bodies: alcohol, skeleton, pelt and dermoplastic4. Alcohol preservation is used for genetic DNA studies and preserves the whole animal. First the animal is treated with formaldehyde in order to prevent tissue decay and then placed in a solution of denatured ethanol (70% alcohol). This process does not preserve colors and is generally not used for display purposes4. Mainly small animals and reptiles are preserved in alcohol. In skeletal preservation, all tissues are removed by placing the specimen in an enzyme solution. Then acetone is used to polish the bones clean. Wires hold the skeleton in place to recreate the original shape of the animal. 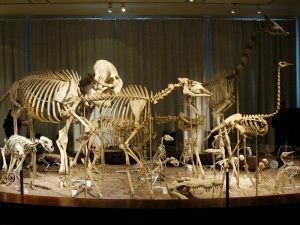 Skeletal displays provide vital information about the structure of an animal and are commonly displayed in museums such as dinosaurs and other extinct animals4. Pelt refers to removing the animal’s skin, drying and then tanning for display. This process keeps the animal’s colors, takes up less space, and is easier to complete than dermoplastic taxidermy. Natural history museums have extensive pelt collections for scientific study4. Dermoplastic taxidermy is a 3D representation of the animal and uses the skin and other original parts such as the antlers, hooves, teeth, and sometimes part of the skeleton4. Dermoplastic taxidermy is the most widely known procedure of taxidermy utilized by hunters and museums. Dermoplastic taxidermy consists of cleaning and preserving the skin then stretching it onto a bodily form5. The animals are first kept in humidity and temperature controlled environment. The skin goes through a tanning process that usually consists of salting, pickling, degreasing, and then bacteria control. Borax or sodium borate is used for salting to kill off bacteria and remove excess moisture. Then the skin is placed in an acid for pickling to allow the skin to absorb chemicals better, making it softer and stretch more easily. Bates are added during the pickling process to prepare the skin for tanning, especially for thicker skin, to aid with fat removal. Degreasing using chemicals or biodegradable degreasing agents removes the remaining fat left on the skin. Soda ash is added to basify the skin from a 2.2 pH up to a 5.5 pH. Bacteria control is completed with a formaldehyde containing solution to prevent decaying. Once tanned, the skin is stretched onto a mount made of polyurethane foam created to match the animal’s body. Paint, varnish, glue and clay are used to help recreate the animal’s shape, posture, and coloring using pictures as a guideline. For alcohol preservation, alcohol and formaldehyde are used to prevent decaying of the organism. Ethanol is typically used for the alcohol solution and has a very low rating of concern to health6. However, formaldehyde or formalin (37% formaldehyde solution) poses serious respiratory health risks from inhaling the fumes7. Formaldehyde exposure has been shown to cause coughing, wheezing, chest pains, and bronchitis. Formaldehyde poses a risk to cause cancer of the lungs and nasal passages. OSHA restricts exposure in the workplace to 0.75 parts per million (ppm) for 8 hour exposure with a short term exposure limit of 2 ppm for a 15 minute period8. NIOSH recommends a level of 0.016 ppm of formaldehyde over an 8 hour work day9. To preserve bones or skeletons, the carcass must be soaked in water with an enzyme containing laundry detergent. While this is safe to use, after most of the tissue is removed, acetone is used to clean and polish the bones which does cause respiratory side effects. Acetone vapors cause irritation to the eyes, mucous membranes and in extreme cases can knock a person out of consciousness10. NIOSH recommends an exposure limit for acetone of 250 ppm (590 mg/m3), while OSHA restricts exposure limits to be below 1,000 ppm (2,400 mg/m3) for workplaces11. Tanning poses the most danger to user’s health due to dangerous fumes. The chemicals used depend on the taxidermist’s preference but below are some of the most common chemicals used for each step in the tanning process. Salting – Borax or sodium borate is a low lung irritant11 and may cause nasal, respiratory or eye irritation13. Pickling – Acid such as formic acid, acetic acid, oxalic acid, Bascal S, sulfuric acid, or hydrochloric acid may be used each posing various health effects. Formic acid has dangerous fumes in high concentrations14 and can be irritating to breathe causing nausea or vomiting15. Acetic acid can be damaging when inhaling the vapor and causes coughing, chest pain, and irritation of the nose and throat16. Oxalic acid causes burning, sneezing, coughing, lung damage, choking and even death in extreme cases5. Sulfuric acid poses serious danger to the lungs and can cause cancer18. Hydrochloric acid, similar to the severity of dangers of sulfuric acid, causes coughing, choking, nose and lung irritation and can even cause death19. Bates used during pickling typically does not add any more danger to the pickling process but should be checked for the compatibility with the pickling acid used to prevent unwanted chemical reactions. Degreasing – Percholoroethylene, trichloroethyne, naphthalene, or biodegradable degreasing agents typically are used for degreasing step of tanning. Percholoroethylene causes respiratory irritation, kidney dysfunction, mood or behavioral changes, impairment, headaches and even unconsciousness20. Long term exposure can cause serious neurological damage. Trichloroethyne has similar effects as percholorethylene causing irritation of the nose and throat but also can cause nausea, blurred vision, disruption to the central nervous system, and even cardiac failure21. Naphthalene is a toxic gas and known carcinogen22. The only degreasing agents that do not have serious side effects are the biodegradable degreasing agents, which are not dangerous at room temperature but can be once heated23. Basification – Soda ash is non-toxic but if inhaled the dust can be irritating to the eyes, throat or nose24. Bacteria Control – Formaldehyde used to be the main chemical used for controlling bacteria but in recent years has been replaced with safer alternatives. However, most of the modern bacteria control chemicals still contain formaldehyde in lower doses but should still be used with caution due to the respiratory side effects. Eulan can be used to prevent parasites4 and is a heavily toxic chemical as well25. 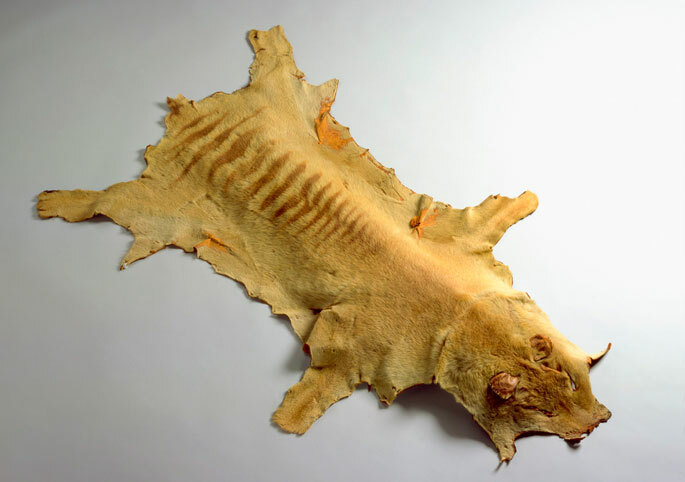 Tanned pelts are mounted on a structure made of polyurethane foam containing harmful flame retardants which have been shown to cause ADHD, low IQ, and thyroid disorders26. However, not all polyurethane foam contains flame retardants, but without the flame retardants polyurethane foam is highly flammable26. Paints, varnishes, glue, and clay may be used to complete the look of the animal making it more realistic. Acrylic paints are relatively safe, but oil paints and latex paints contain harmful volatile organic compounds that cause asthma, eye/nose/throat irritation, and neurological disorders27. Varnish and glue have similar effects as oil paints and when inhaled pose respiratory health risks28. Clay while mixing can cause silicosis from the silica. Silicosis causes shortness of breath, dry cough, emphysema, and increases the likelihood of developing lung infections like tuberculosis29. To control fumes from harmful chemicals used during the taxidermy process, taxidermists should work within a ductless fume hood, use a portable fume extractor next to the process, or a combination of the two for added safety or for different processes. A ductless fume hood provides an enclosed workspace with a powerful air flow to protect the user from breathing harmful fumes. The fumes are brought into the filter chamber and filtered air is released back into the ambient room. 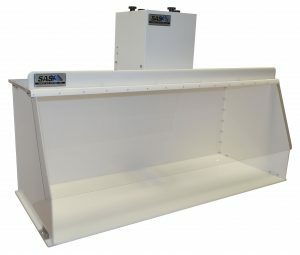 Ductless fume hoods are available in a variety of widths with the 24” or 30” width would be a good solution for small animals but for a larger workspace the 60” or 70” width would be a better choice. Portable fume extractors capture fumes at the source through an adjustable hose and filter airborne contaminants to protect the user’s breathing zone. Sentry Air Systems recommends Model 300 Portable Floor Sentry. 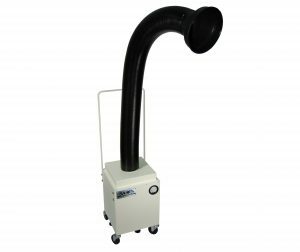 Portable fume extractors allow for a larger workspace but do not offer the same protection as an enclosed fume hood. Custom hood sizes and walk in fume hoods or machine enclosures are available as well. Please contact us for more information. Industrial hygienist Robert F. Adams and our staff chemist Luke Turner conducted an experiment on April 8 and April 27, 2011 to demonstrate the effectiveness of removing formaldehyde gas from evaporated liquid formalin using the Model 300 Winged Sentry with lid. Formaldehyde gas is best captured at the source due to the low level of odor associated and once the odor appears the levels of formaldehyde in the air may be over the recommended level. OSHA restricts formaldehyde exposure in the workplace to 0.75 parts ppm for 8 hour exposure with a short term exposure limit of 2 ppm for a 15 minute period8. NIOSH recommends a level of 0.016 ppm of formaldehyde over an 8 hour work day9. Three tests were conducted with two different filter types tested: charcoal treated for the removal of aldehydes and an activated carbon filter. After having low results from the first test, the third test was conducted with the same filter in order to keep the airflow at the same level as the second test for easier to compare results. From these results it is apparent that both filters maintain formaldehyde levels below NIOSH’s recommended level of 0.016 ppm and OSHA’s permissible exposure limit of 0.75 ppm. Sentry Air Solutions recommends using the specially treated charcoal for removing aldehydes for maximum protection from fumes. Even though this test was conducted on a smaller unit, similar results would appear from larger units with similar filtration methods. Contact Sentry Air Systems for a taxidermy fume control solution for your taxidermy business! 1. “Taxidermy and Skins.” Natural Science Collections Association, https://www.natsca.org/taxidermy. 2. Bryant, Charles. “How Taxidermy Works.” How Stuff Works, https://adventure.howstuffworks.com/outdoor-activities/hunting/game-handling/taxidermy.htm. 3. Blitz, Matt. “Why Taxidermy Is Being Revived for the 21st Century.” Smithsonian, 2015 June 19. https://www.smithsonianmag.com/arts-culture/why-taxidermy-being-revived-21st-century-180955644/. 4. “Taxidermy Techniques.” Naturhistorisches Museum Wien, http://www.nhm-wien.ac.at/en/research/1_zoology_vertebrates/zoological_preparation_unit/taxidermy_techniques. 5. Schaefer, Ron. “The Chemistry of Tanning.” Heads Above the Rest, http://www.headsabovetherest.com/article_taxidermy_chemistry_of_tanning.html. 6. National Center for Biotechnology Information. “Ethanol.” PubChem Compound Database; CID=702, https://pubchem.ncbi.nlm.nih.gov/compound/702. 7. Environmental Protection Agency. “Formaldehyde.” https://www.epa.gov/sites/production/files/2016-09/documents/formaldehyde.pdf. 8. United States Department of Labor. “OSHA Fact Sheet: Formaldehyde.” Occupational Safety and Health Association, https://www.osha.gov/OshDoc/data_General_Facts/formaldehyde-factsheet.html. 9. Centers of Disease Control and Prevention. “Formaldehyde.” The National Institute for Occupational Safety and Health, https://www.cdc.gov/niosh/npg/npgd0293.html. 10. National Center for Biotechnology Information. “Acetone.” PubChem Compound Database; CID=180, https://pubchem.ncbi.nlm.nih.gov/compound/180. 11. Centers for Disease Control and Prevention. “Acetone.” The National Institute for Occupational Safety and Health, https://www.cdc.gov/niosh/npg/npgd0004.html. 12. “Getting to the Bottom of Borax: Is it Safe or Not?” Crunchy Betty, 2017 Dec 4. https://crunchybetty.com/getting-to-the-bottom-of-borax-is-it-safe-or-not/. 13. National Center for Biotechnology Information. “Borax.” PubChem Compound Database; CID=10219853, https://pubchem.ncbi.nlm.nih.gov/compound/10219853. 14. Crampton, Linda. “Formic Acid Dangers and Use in Nature and in Human.” Owlcation, 2017 Dec 18. https://owlcation.com/stem/Formic-Acid-Dangers-and-Uses-in-Nature-and-in-Humans. 15. National Center for Biotechnology Information. “Formic Acid.” PubChem Compound Database; CID=284, https://pubchem.ncbi.nlm.nih.gov/compound/284. 16. National Center for Biotechnology Information. “Acetic Acid.” PubChem Compound Database; CID=176, https://pubchem.ncbi.nlm.nih.gov/compound/176. 17. “Material Safety Data Sheet: Oxalic Acid.” Science Lab, http://www.sciencelab.com/msds.php?msdsId=9926346. 18. National Center for Biotechnology Information. “Sulfuric Acid.” PubChem Compound Database; CID=1118, https://pubchem.ncbi.nlm.nih.gov/compound/1118. 19. National Center for Biotechnology Information. “Hydrochloric Acid.” PubChem Compound Database; CID=313, https://pubchem.ncbi.nlm.nih.gov/compound/313. 20. National Center for Biotechnology Information. “Tetrachloroethylene.” PubChem Compound Database; CID=31373, https://pubchem.ncbi.nlm.nih.gov/compound/31373. 21. National Center for Biotechnology Information. “Trichloroethylene.” PubChem Compound Database; CID=6575, https://pubchem.ncbi.nlm.nih.gov/compound/6575. 22. National Center for Biotechnology Information. “Naphthalene.” PubChem Compound Database; CID=931, https://pubchem.ncbi.nlm.nih.gov/compound/931. 23. Mykal Industries Limited. “Safety Data Sheet: De Solv It Aqueous Degreaser Plus.” http://www.farnell.com/datasheets/420093.pdf. 24. “Health and Safety.” Ansac, http://www.ansac.com/products/health-safety/. 25. National Center for Biotechnology Information. “Cyflurthrin.” PubChem Compound Database; CID=104926, https://pubchem.ncbi.nlm.nih.gov/compound/104926. 26. Emerson, Ali. “Is Polyurethane Foam A Dreamy Comfort or Toxic Nightmare?” Green Future, 2017 Mar 2. https://greenfuture.io/sustainable-living/spray-polyurethane-foam-toxic/. 27. Epstein, Angela. “Will Doing Up the Front Room Make you Ill?” Daily Mail, 2010 Nov 9. http://www.dailymail.co.uk/health/article-1327910/Paint-fumes-trigger-asthma-cancer-Hidden-dangers-decorating.html. 28. Park, Alice. “Paint and Glue Fumes Mess with Your Brain for Decades.” Time Magazine, 2014 May 12. http://time.com/94361/paint-and-glue-fumes-mess-with-your-brain-for-decades/. 29. “Ceramics.” Princeton University Environmental Health and Safety. https://ehs.princeton.edu/health-safety-the-campus-community/art-theater-safety/art-safety/ceramics.